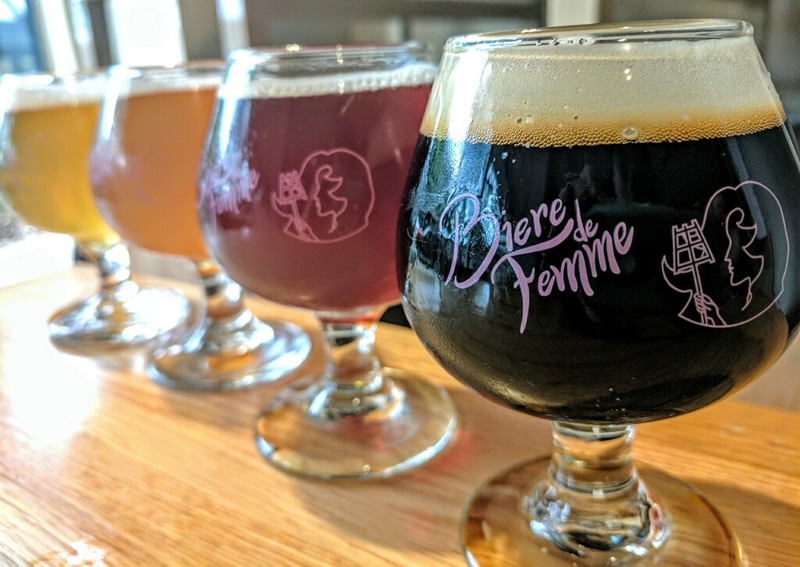 Bière de Femme is a festival designed to showcase the women of NC beer, while also raising money for women to pursue their beer career dreams through education. During our May 2016 meeting I challenged the members of the Raleigh, North Carolina chapter with a specific question: Rather than working hard on many small events and spreading ourselves thin, what were some events/projects that could combine our efforts to raise significant amounts of money? In November 2016 chapter members Jordan Boinest and Anita Riley brought forward a festival idea at a meeting and Bière de Femme was born. We decided at that November meeting that we would donate 100% of our proceeds to Pink Boots Society. 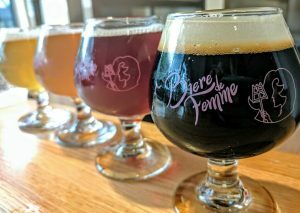 Our 1st Bière de Femme Festival took place four months later, on March 11, 2017 in Shelby, NC . Last year we raised almost $11,000! We hope to hit $18,000 this year. On a side note, co-chapter leader Anita Riley wrote Brewing Ambition: Recipes & Stories From the Women of North Carolina Craft Beer. In addition to being a great read full of homebrew recipes, it’s a great gift. All proceeds go to Pink Boots. The 2nd annual Bière de Femme happens March 3, 2018 in Raleigh, NC. Organization is definitely a task that has brought our team together! We utilized some great programs for communication, delegated tasks, and kept very open lines of communication throughout the process to be successful. The app Asana for delegation/communication helps us see who is working on what, and progress made. We created a to-do list/timeline and have tried to follow it as best we can. We have bi-weekly check-ins with everyone available. Each chapter member brings a certain skill set that is extremely helpful in organization – for example Anita Riley (our other Raleigh Chapter Leader) is a writer- so she is our media communications manager. Katie Smith (Asheville Chapter Co-Leader) is a social media whiz- she handles our posts and also organizes our volunteers. 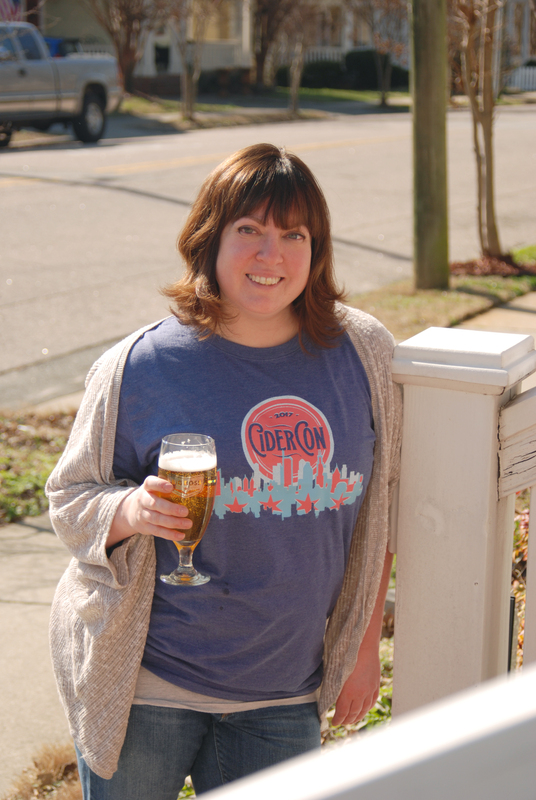 Natalie Anderson (Raleigh Chapter member) who runs a brewery has managed people her entire adult life. She helped us organize the task list and heads brewery communications for the event. Each person’s ownership of certain responsibilities allows us to not stretch ourselves too thin and ensures we move forward. Don’t try to do it alone, work as a team or the tasks will be impossible. Delegate tasks to your chapter members; each has skills or contacts that will prove very useful. Life happens, so have a backup plan in place if someone has to step away from their duties. Contact the board for help, there are many resources available if you need them. Don’t be afraid to ask for sponsorship money. You never know unless you ask In-kind sponsorships are great too, we have received them for glassware/t-shirts/media promotion. Designate one person in charge of money, so things done get confusing. Thank you for taking the time to read this and I must say I am honored to be a part of such a dynamic group of women breaking molds and providing support to one another. North Carolina has come a long way in 4 years with the progression of women in our beloved industry. I hope you’ll be able to join us at Bière de Femme this year! Cheers to women in beer! In the spring of 2007 I took a RV cross country road trip with some girlfriends that changed the course my life forever. Instead of LSATs and law school I decided I would pursue my dream of making beer for a living. I immediately began volunteering at a local brewery in Raleigh on their bottling line on an as needed basis. They paid me in hi/low fill beer. After a couple years of volunteering, I took an (unpaid) assistant brewer position at a new brewpub in town. Three years later I was sidelined by a kickball accident. During my recovery I decided that in order to move forward in the industry I would get a formal brewing education. After registering for the full Advanced Brewing Theory course through Siebel Institute of Technology in 2014, I reached out to PBS to see what financial aid resources were available. Founder Teri Fahrendorf replied to my email for help quickly, with some pointers and a wish of good luck. Unfortunately, PBS simply did not have funds to help with that size of a scholarship. I’ll never forget Teri’s encouragement and support; it was very welcomed. I was the only women working on the production side of a brewery that I knew of in my city. I did not know many women in the industry at all, and I was only one of two women in the Seibel program. As they say, all’s well that ends well. Soon I will become Product Manager for sensory kits and also will take on a larger marketing/business development rolle within Lallemand Brewing/Siebel Institute of Technology.